In a recent article in the New York Times (September 13, 2013), Susan Dominus described how the Office of Personal and Career Development at Wake Forest University is transforming the liberal arts by emphasizing the importance of job placement. Although the discipline of philosophy was only mentioned off-hand at the end of the article, the New York Times decided to entitle the article, "How to Get a Job With a Philosophy Degree." I am not sure exactly why the New York Times decided to give this article this particular title, but given the rhetorical build up at the end, one surmises that it is because philosophy is thought to be obviously one of the most impractical subjects one can study. And when Andy Chan, who is quoted throughout the article, tells parents to "hold their tongue" if their child expresses a desire to be a philosophy major, because they may "decide they love math anyway," and that he will help turn "academic risks into résumé-ready experiences," it sounds like Chan agrees. Philosophy is a risk, but a good college placement office will teach your child to be successful anyway. I have sympathy with the idea that there is something "impractical" about philosophy. The discipline has a long tradition of taking pride in this fact, and Plato famously argued that one would have to use force to get a philosopher to become involved in the common affairs of the world. In addition, many of the problems that philosophers think about have very little direct impact on day-to-day business. However, many of the problems they think about do have direct impact, especially in the ambiguous area of contemporary ethics. This is one of the reasons why Google has hired a philosopher. However, the case for hiring a philosophy major is much stronger than this. Ms. Dominus' article quotes the CEO Alan Naumann saying that he hopes graduates have "analytical skills." It is difficult to find a subject area that provides better analytical skills than philosophy. 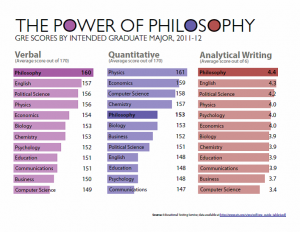 Students intending to be philosophy majors consistently score among the top verbal, quantitative and analytical writing scores of the GRE, and in many years they score higher than all other majors. 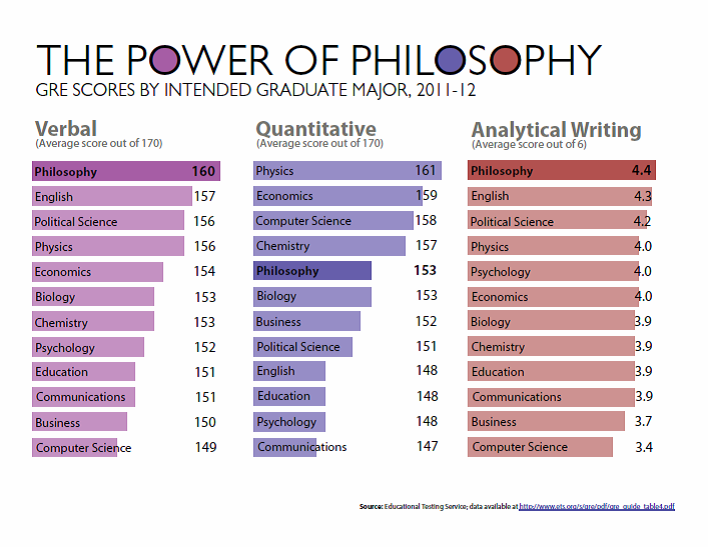 Philosophy majors do better on LSATs than any other majors, and easily outperform business students on GMATs. This should not be in the least surprising: contemporary analytical philosophy teaches logical reasoning, and philosophy majors have to deal with some of the most difficult texts and issues human beings have ever come up with, whether it be the foundations of morality, Kant's transcendental dialectic, Aristotle's metaphysics, or defining concepts like rotation in relativistic physics. In the age of business innovation, however, the argument for hiring a philosophy major is even stronger than this. Philosophy has been many things, but since the time of Socrates, the art of questioning assumptions, asking, "Why?," and drawing out the implications of alternative assumptions are the most fundamental activities of the discipline. Businesses now call this activity, "thinking outside the box," but in the ancient world it was called dialectic, and it was the very core of the discipline. 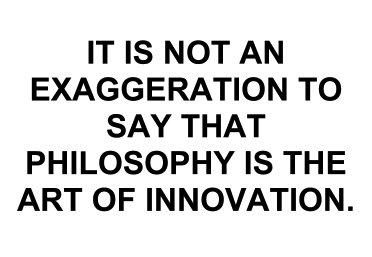 Even today, it is not an exaggeration to say that philosophy is the art of innovation, because it is the discipline most focused on questioning the status quo. 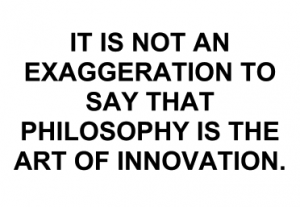 If a company is not good at developing innovations, or is facing a situation in which existing frameworks are failing, then they may seriously want to add a philosopher to their payrolls. In addition, many philosophy majors have been extremely successful in business: George Soros, Reid Hoffman, Don Brownstein, Carly Fiorina, Larry Sanger, and Patrick Byrne among others. Of course, not all philosophy majors will be at home in a business context. The very same skepticism that allows great innovations to happen also can lead philosophers to challenge the underlying assumptions of a business culture, capitalism in general, or to choose to pursue a life of the mind. In addition, contemporary business is often driven by mathematical models that some philosophers are ill-equipped to deal with. But philosophers do come in all stripes: in my own sub-discipline of philosophy of science many philosophers are experienced mathematicians, physicists, psychiatrists and biologists and quite comfortable with statistical concepts. Because these individuals have both mastered a science and philosophy, they can both do the math and understand deeply why the math works. It is curious that this subdiscipline is not on the radar of most corporations. According to many business leaders today, they want employees with analytical skills who can questions assumptions and develop entirely new approaches for the 21st century. People who not only can handle complex or ambiguous problems, but also truly thrive in such environments. Yet, at the same time, HR departments in these very same companies routinely select for mere technical proficiency or for people who have only proven they can operate well within already existing frameworks. It's about time that companies start realizing that in an age driven by innovation, hiring a philosophy major is not a risk, but not hiring one may be. Image by Ty Fagan, courtesy of Katrina Sifferd. See also the additional charts here.